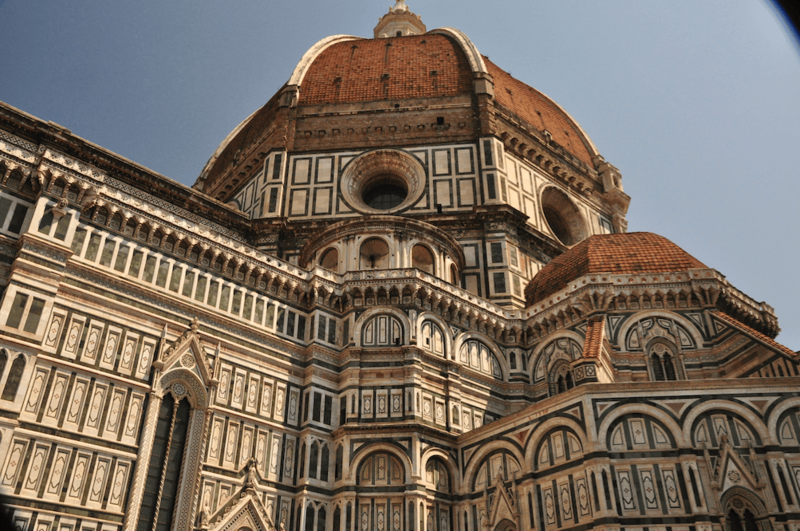 Florence Cathedral or Basilica di Santa Maria del Fiore or even Il Duomo di Firenze is Florence’s main church and the fourth largest church in the world. The structure, and in particular its red tiled Dome and the pink, green and white of its façade is Florence’s most dominant landmark. Florence itself is a memorable city for anyone on an Italian vacation. The urban landscape has not changed since the medieval times – the streets are narrow and atmospheric, and Florence Cathedral completes the package perfectly. The story about Florence Cathedral goes that Florence was unhappy with having a small cathedral that was unsuitable for the size of its congregation, whilst its urban neighbours Pisa and Siena were undertaking reconstruction projects of their cathedrals. So, the city hired Arnolfo di Cambio in 1294 to design Florence Cathedral. The first stone was laid in 1296 and the structure took over 140 years to complete. Work on the famous dome of Florence Cathedral started in 1420 and was completed in 1436 by Brunelleschi – one of the most impressive pieces of architecture from the Renaissance period. A statue of Brunelleschi sits outside in the Piazza del Duomo looking up at his work. Although the cathedral was completed in 1496, the façade remained unfinished until the 19th Century. Emilio de Fabris won the competition that was held to design it and the end result was a striking look using white, green and pink marble. The interior of Florence Cathedral is quite a contrast to the exterior. It does preserve many important works of art but some of the sculptures that were created for the Florence Cathedral have since been moved to the Museo Dell’Opera dell Duomo. As a result, it seems much more empty when you compare it to the opulent design of the outside of the building. One of the earliest works of art inside Florence Cathedral is Gaddi’s mosaic of the Enthronement of Mary that is above the inside of the main door. The frescoes in the inside of the Dome are particularly colourful – designed by Vasari and painted by his student Zuccarri. They do have a reputation of being less than good because his student painted them. But recent renovations have really brought out the colour of the work, if not the technique. 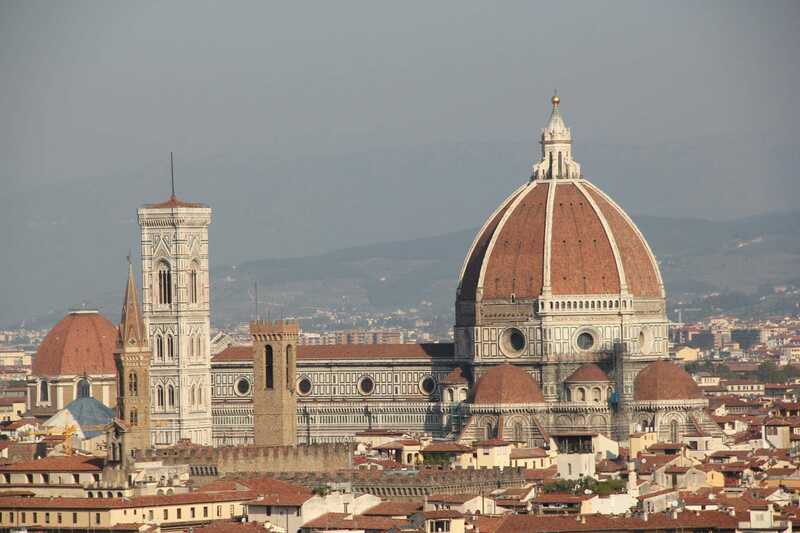 If you visit Florence Cathedral during your Italian vacation, you can also climb the dome of Florence Cathedral. It is wonderful to get close to the impressive structure which was quite genius in its design at that time. Whilst you are up here surveying Brunelleschi’s Florence Duomo, you can reflect on the fact that no one else but him seemed to be able to think of a way to fill the 150 ft wide space for a dome. It was a problem that worried the authorities in the city but he managed to solve it taking inspiration from the Pantheon in Rome. You will also get a fabulous view of the city of Florence, also. The bell tower also forms a striking part of the Florence cathedral complex – along with the Duomo Florence, the basilica and the baptistery. Although its known as Giotto’s bell tower the renaissance painter died when only the first two levels were complete. It was saved, and structurally improved by sculptor Andrea Pisano. Talenti completed the tower in 1359 and again improved the design. At that point, it became known as ‘The Lily of Florence’. 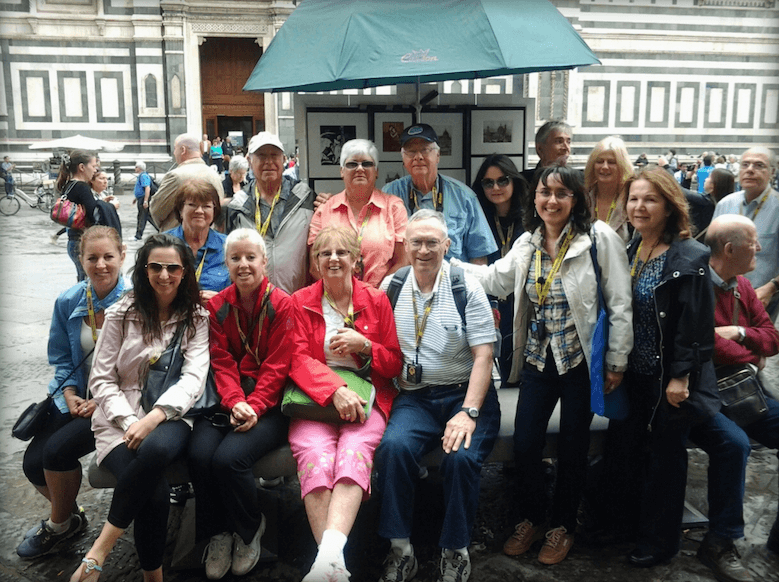 View all of our tour options in Florence.